“..Reichswald Forest War Cemetery. ..”. That forest area gets quite a lot of mentions re the unfortunate Market Garden/Arnhem land.campaign. Especially in Robin Neillands writings. Many casualties buried there I imagine. Norman Burrows as far as I know was engaged to my stepmother but I’m not absolutely sure. She called him Tops! I found a book he had given her in the bookshelf at home the other day. Does anyone know if this is he? Jane. 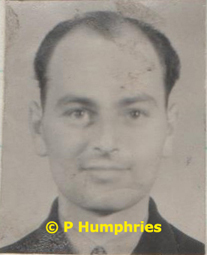 Norman was my uncle, and I know my dad used to talk about him and his nickname was ‘tops’ my dad said due to his height and the lack of hair he had… Also, I know he was engaged (c1942 to an Liverpool lady) – I think but not 100% the lady was called ‘Jane’ like yourself. Rather belatedly I have just seen your email. Thank you for replying. My step mother’s name was Dorothy Spencer. She Told me his plane was blown up over the dam and So I was surprised to learn the plane had tried to reach home and that the occupants had been found and buried in a war graves cemetery. Happy for that. Jane, Norman Burrows is my Uncle. and i see what i can help you out with, i have passed a copy of your messages to my sister who know more about my father and his family and she will be very interested in fulling her family tree, so if you can forward me a email that would be much appreciated. My i send season greeting for this time of year. Rather belatedly I’ve just read your reply. My step mother’s name was Dorothy Spencer and she lived in Banbury although she was born in Derby. She told me his plane had been blown up over the dam and never knew it had tried to reach home and that he had a final resting place and tombstone in a cemetery. Norm e-mailed about the Dambuster and yourself. I am Manon, Alf’s oldest child and I do remember you. Dad past away April, 2013 and up to the last few weeks before he went,he spoke strongly and passionately about Norman and Annetta. I have heard that Norman was engaged but sorry do know the lady’s name.